The Drawing of the Three. Seven hours after the events of “The Gunslinger," Roland awakes from a dream regarding one of the Tarot cards the man in black drew for him in the first book. He finds he’s on a beach and being attacked by what he calls a “Lobstrosity,” a cross between a lobster and a scorpion. The thing bites off fingers from his shooting hand and also his big toe, rendering him unable to shoot the things. 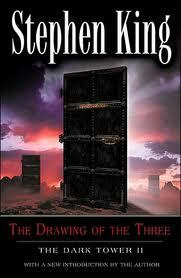 He steps through the door and into the mind of a heroin addict named Eddie Dean. It is 1987 in New York City. Eddie is transporting drugs for a man named Enrico Balazar in order to save his brother Henry. Eddie becomes aware of Roland in his head and Roland convinces Eddie that the airline crew knows about the drugs he has on him. Eddie flushes them and when they land they meet up with Jack Andolini who takes them to Balazar. Angered about the drugs, Jack takes Eddie into the bathroom to check Eddie’s body; Roland then pulls both Eddie and Jack into his world through the door. Jack runs in shock and is devoured by the Lobstrosities. Eddie and Roland return, armed, to New York City and have a gun battle with Balazar and his crew to rescue Henry. Unfortunately, Henry gets decapitated. Having found aspirin while in Eddie’s world, Roland begins to heal. They both return to Roland’s Mid-World and walk down the beach. Eddie begins going through withdrawal symptoms and when they get to a second door marked “Lady of Shadows,” Eddie begs Roland to let him go through to get himself a fix of heroin. Roland refuses and goes through it alone. He meets Odetta Holmes, a black woman with multiple personalities. She is missing her legs and is in the civil rights movement of 1960s New York. Her second more vile personality is Detta. They are pulled into Roland’s world as well. The third door labeled “The Pusher” reveals a sociopath named Jack Mort. He takes pleasure in killing and injuring strangers. He is responsible for the head trauma to Odetta causing the split personalities, and also the loss of her legs. He is also the man who pushed Jake Chambers into the train that killed him. Roland kills Jack and in doing so, fuses the personalities of Odetta and Detta forming a third personality of Susannah. Because Roland saved Eddie from his addiction, and fused together the personalities of Odetta/Detta Holmes; They both feel they owe their lives to the Gunslinger. Together they form what is called “ka-tet” meaning “One Made From Many/Sharing the Same Destiny,” and hence begins their quest for The Dark Tower. Links to the Dark Tower Two: Randall Flagg who is the Man in Black and also the adversary in “The Stand” and “The Eyes of the Dragon.” Eddie Dean speaks about watching the motion picture “The Shining.” The mobster from “Thinner” (written as Richard Bachman) Richard Ginelli, is mentioned in this book. The Lobstrosities were also seen in the short story “The Mist.” There is also mention of a character reading a book by Clay Blaisdell. Clayton Blaisdell Jr. is the main character in the book “Blaze” (also written as Richard Bachman).